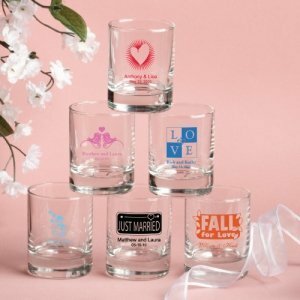 An affordable way to add a custom touch to your wedding favors, these glass items can be used as wedding shot glasses or as votive candle holders (votive candles are not included). You can choose from many ink imprint colors and over 50 different designs to coordinate perfectly with your event. Gift boxes for these glasses are available during the checkout process, for an additional fee. The glasses measure 2.5" tall x 2" in diameter, with a 3.5" ounce capacity. Note: For sample orders, you will not be able to specify personalization. Your item will consist of a random representative sample.